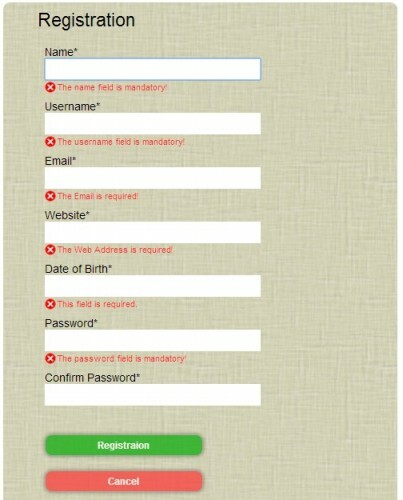 There are several jquery plugin to validate form data but what I prefer is definitely Validation . availability of a wide range of methods “build-in” , that is already present basic validations to perform the “standard” (the required fields, email validation, etc..). possibility of introducing a simple new custom validation methods (eg validation through regular expressions ). 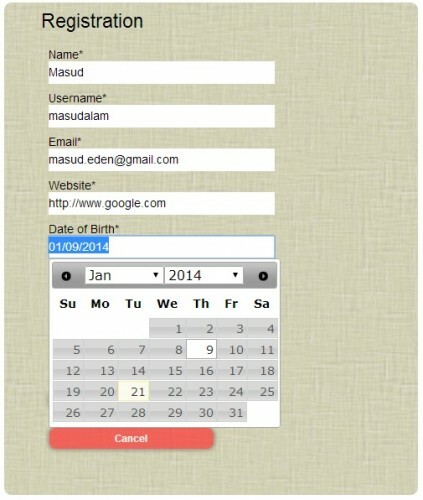 ability to perform validations using ajax . In this tutorial we will examine these three aspects consulted for further details on the official page of the Validation plugin . 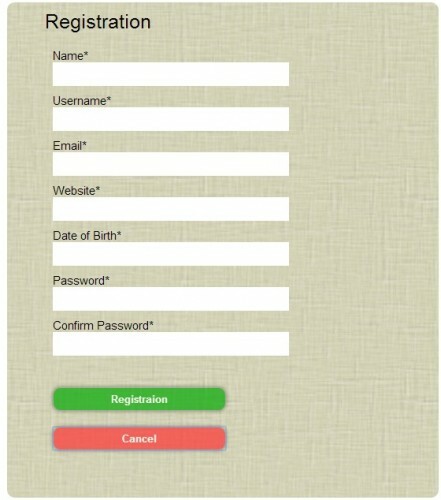 Verify that it is not already a registered user (ajax). Verify that it is not an email has already been registered (ajax). With a minimum length of 8 characters. Before we move on let’s see in detail the following validation in term general mode of implementation of the plugin. In order to validate each field should indicate the rules , ie the validation rules, specifying methods (build-in or custom) to be applied. And you can (optional but preferable) indicate the messages , or error messages for each field and method validation applied. remote: "The username is already in use by another user!" remote: "The email is already in use by another user!" required: "The Web Address is required!" minlength: "Please enter a password at least 8 characters!" equalTo: "The two passwords do not match!" The types of validation that we perform on our form often recur. For example: mandatory field, minimum and maximum length of a field, the validation of the email address or a URL, etc etc..
For all these kind of validations ” standard “Validate plugin has methods ready to use. equalTo : whose parameter is the field to be compared in order to verify the correspondence between the two camps. Obviously for additional methods, please refer to the official documentation. In some cases it may happen that the type of validation that we need is not available in the build-in methods and therefore it will be necessary to implement it. In essence must create an additional validation method in addition to those already present. To do this, use the function addMethod . The function takes three parameters addMethod the third of which is optional: the name of the method, the function that performs the validation and error message by default (that is, the error message that appears in the event of failure to define the messages). In particular, the function that will perform the validation parameters such as the value of the field to be validated, element (boolean value) and any parameters. In our specific case, we need to validate the syntax of the user name with a regex (regular expression) . The ease with which you can perform validations using ajax is, in my opinion, the biggest advantage provided by this plugin. In the case of our registration form we will have to avoid recordings username or email address already used by other users . This can only be verified through a request on the server side (with php). Within the rules of the method that is going to use the remote which will allow us to make asynchronous requests to the server side, ie AJAX . It takes as a parameter obbligatoro the url of the file to which direct the request but optionally you can also provide other data (such as the method of sending a POST or GET). We shall, therefore, first create a php file in which to address these requests. Thanks a lot. 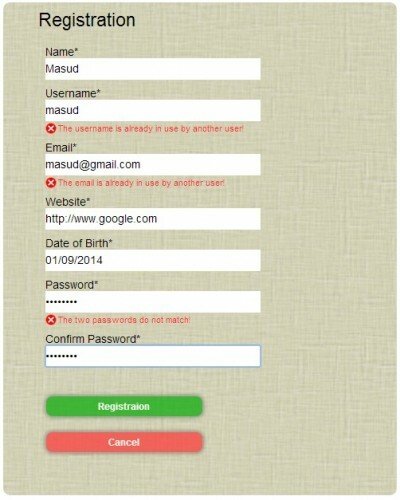 I’ve bn browsing the net to find a validation registration, I couldn’ t find the one I liked until now.